Do you want a smart juicer that is highly efficient at extracting juice from fruits and vegetables? 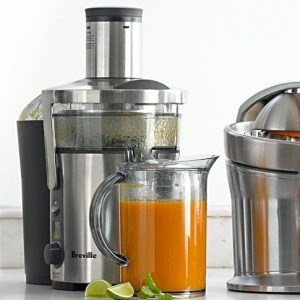 If so, we highly recommend that you consider purchasing the Breville BJE510XL Juice Fountain Juicer. The Breville BJE510 Juicer is a smart juicer with variable speeds ranging from 6500 RPM to 12500 RPM. 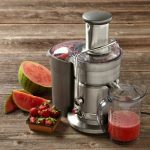 The speed of the juicer can be adjusted depending on the type of food being juiced. Low speeds are for juicing softer fruits and vegetables and high speeds for juicing harder fruits and vegetables. 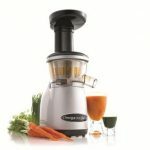 – What makes the Breville BJE510XL Juice Fountain stand out from other juicers is the variable speed system that it comes with. Not all fruits or vegetables can be juiced efficiently at the highest speeds without killing off healthy enzymes and oxidizing the juice. A variable speed is needed to ensure efficient juicing. A lower speed motor is required to extract the maximum amount of juice possible from softer produce (tomato, beets, and banana) whereas higher speeds are required to extract maximum juice from harder produce (apples/pineapple). The variable speed system ensures maximum extraction of juice regardless of the type of produce. 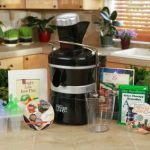 – One of the main issues with high speed centrifugal juicers is that their high speed tends to kill of healthy enzymes and oxidizes the juice. As a result, the nutritional value of the juice is reduced. The variable speed system of the Breville BJE510XL ensures preservation of healthy enzymes and prevents the juice from oxidization. This enables the juice to be stored longer – for a period of 72 hours. – Another feature that makes the Breville BJE510XL stand out is the extra wide feed chute that it comes with. Most juicers have very small chutes about 1.5 – 2.5 inches. The Breville BJE510XL comes with an extra-wide 3 inch chute that allows you to feed fruits and vegetables without having to slice them up into tiny pieces. This saves you time and hassle. – The juicer has overload sensors that shut off the unit automatically when it’s overloaded. Overheating of the unit is also prevented with the help of these sensors. This increases the overall lifetime of the unit significantly. 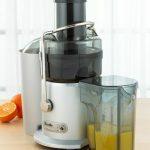 – Like most juicers in the market, the Breville BJE510XL is also quite noisy. 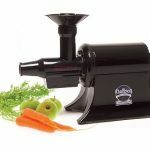 There are some masticating juicers that make very little noise. Unfortunately, the Breville isn’t that quite. It’s loud and can be troublesome for two people to have a conversation with the juicer running. Overall, The Breville BJE510XL is an excellent juicer for juicing vegetables and fruits. We don’t recommend the juicer for leafy greens because none of these juicers are efficient at it. If you’re dieting and need to juice leafy greens regularly, we recommend a masticating juicer.